The Lomandra plant is considered a common plant in Australia and a key feature of any Gold Coast Seascape. Hardy and drought resistant, thrives in the salty air of the Gold Coast and always looks green and gorgeous. The name Lomandra is from the Greek Loma meaning an edge or border and andra meaning man. The scientific name of Lomandra is Lomandra confertifolia ssp rubiginosa. It was once thought to be in the same family as Xanthorrhoea and the two appear to have a lot in common. Lomandra is actually a member of the subfamily Lomandroideae and the family Asparagaceae who are a genus of perennial herbs. There are approximately 50 known species like Lomandra banksil, Lomandra effusa, Lomandra patens and more species, all native to Australia hence the extreme drought tolerant properties and hardiness. 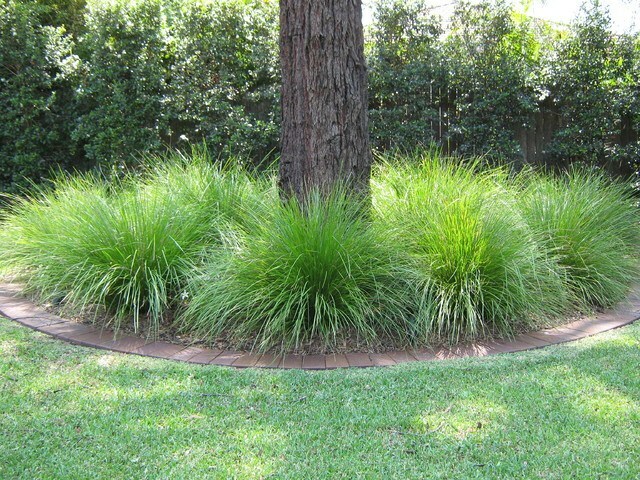 The Lomandra is one of the toughest, most reliable landscape plants and soft evergreen foliage and it’s for this reason that landscapers value it so often in their designs. Especially for people looking for great looking low maintenance gardens all-year-round. The Lomandra plant has beautiful blue-grey foliage and elegant weeping habit. It is evergreen in most situations and almost indestructible. During summer highly fragrant small yellow blooms appear that fill the air with a sweet aroma and the very fragrant small yellow flowers emerge from reddish-brown buds on spikes that rise up to the top of the foliage. The flowers are cream to bright yellow, hence the common name. The male flowers are ball-shaped, up to 2mm in length, while the female flowers are more tubular, up to 3mm in length. Lomandra extremely frost hardy and drought tolerant, because it has long dark blue-grey slender leaves, forms a clump in a weeping habit and foliage type is linear. It can be grown in full sun or partial shade and fertile well-drained soil once a month, it can grow in a range of sandy soils, in swamps and wet places to the montane zone on banks of creeks, rocky hillsides, cliffs and open forests. And it is considered a highly colourful plant that has attractive foliage, rabbit resistant, winter interest and low maintenance. That Dark green foliage grass like plant is low-growing and low-maintenance, remarkable container or groundcover display. The Lomandra ticks all the boxes for a wide variety of landscape designs, especially this close to the salty ocean breeze. To plant Lomandra we have several requirements. Plant in a well-mulched garden (chunky mulch is recommended). Ensure crown or base of the plant is not below soil or mulch level and if required use slow-release fertilizer in spring. Every 3-10 years cut back 15cm above the ground if required (it will look better with pruning every 3 years, this depends on your requirements). Lomandra propagates by seed or clump division and spreads by underground creeping rhizomes and when affected by fire will re-establish from these. These species become noticeable at flowering time – mainly from October to November, but this may vary according to locality. There is no special soil PH requirement and it can grow in a semi-shaded area like light woodland or non-shaded area. It is relatively easy to maintain Lomandra. Moist soil is required for growth of the plant, but it would not die out without water. It is a compact perennial herb growing up to 50cm tall in sparse clumps up to 20cm in diameter with a semi-arching habit. The leaves are stiff, approximately 3mm to 5mm in width, with inrolled margins and are dull green to bluish-green in colour. Each leaf is tipped with one to three tiny light brown points. When the fruits are matured and turn brown, sow the seed in moist soil for 6 weeks in the greenhouse or outdoor than the clump division started by dividing the plant into half and plant them in moist soil indoor or outdoor. There is not much cultivation limitation for this plant in Australia, but the plant can die back when it is in a wet winter nor does it survive well in areas with cooler summers. Lomandra is a versatile plant for garden design, and ideal for mass plantings, patio pots, rockeries and border perimeters. This is a hardy, attractive plant which is quick to establish yet non-invasive preferring to contain itself to clumping to approximately 75cm diameter. It is particularly useful in small gardens and courtyards as a design feature and can be planted to complement native grasses. As it is slow growing this makes it ideal as a container plant. This form and colour make it a great plant for a raised planter or large pot where the foliage can arch over to hide an edge. Aboriginal people use the leaves of Lomandra to make strong nets and baskets, and they consume the base of Lomandra leaves as food. So we can classify uses of Lomandra with the following. Urban landscapes: Plants in public open spaces cop all kinds of mistreatment. They are regularly trampled or even pulled out and their growing environment is often less than ideal. Heat from pavements, buildings, roads etc combined with poor air quality and limited irrigation render the urban landscape one of the most difficult areas for growing plants. Road Corridors: Even more hostile than the urban landscape is the roadside environment. Non-irrigated, north facing batters present the greatest challenge. Lomandra are proven performers on the verges and median strips of roads and freeways. Formal Gardens: Lomandra certainly have a place in the palette of the formal garden. Too often it is assumed that these plants belong in rustic bush garden settings only. Many Lomandra have the regular form so vital in a formal planting. Used well they can provide another dimension of foliage contrast and as borders for pathways, garden edges and retaining walls. Containers: Narrow-leaved Lomandra looks fabulous in containers. It looks good in single pots as ‘specimens’, however, if planted in clusters of pots with perhaps the pot size or height being the only variable, the effect can be remarkable. 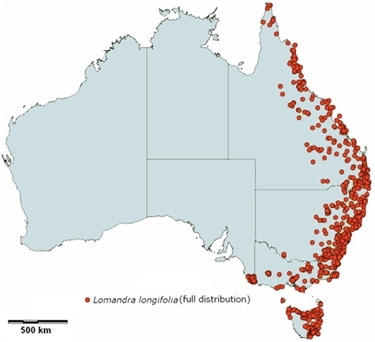 Lomandra distributes in several different regions. Queensland, N.S.W., Victoria, South Australia and Tasmania are the most important areas where Lomandra appear in it. The map below shows the distribution of this plant in Australia.